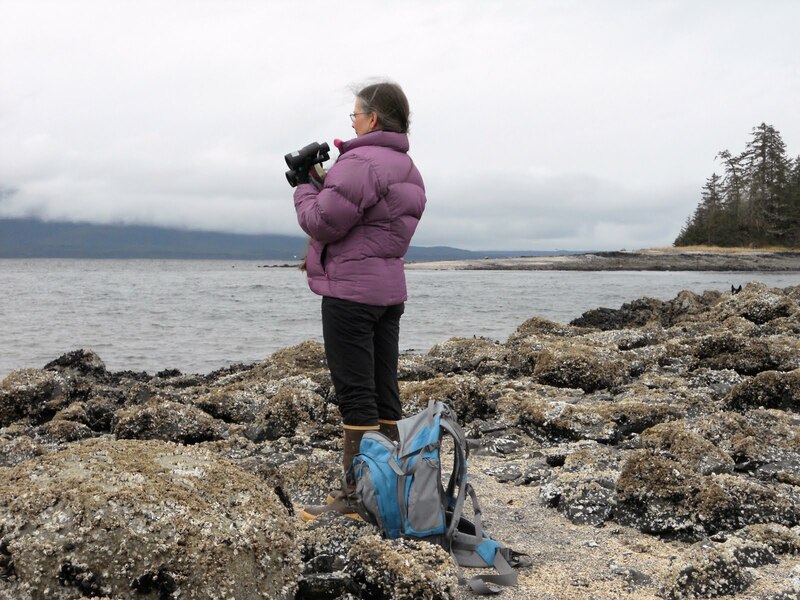 Andrea Balosky-Nyima Lhamo is an improvisational and creative woman, writer, quilter, and friend whose story crosses an island, three oceans, and several continents. As Andrea, she was blessed to be born and grow up in Hawaii. As a quilter she was blessed to move to Oregon and live and quilt in the woods of Camp Sherman and become self-apprenticed to a number of quilters and guilt venues. There, she created beautiful quilts and had them entered in wonderful venues and setting inside and out. As a writer, she wrote a wonderful little book "Transitions, Unlocking the Creative Quilter Within." As Andrea becoming Nyima, she has become an inspirational story of an American woman who thought she was giving up her quilting life for a far greater calling and a much deeper and meaningful purpose by moving to India in 2004 and taking her new name Nyima, who is, as she describes herself.... a “Buddhist recluse, but recently with internet access." 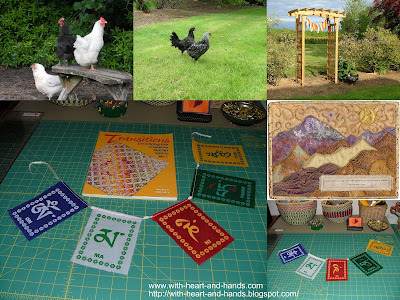 But as Andrea Balosky/Nyima Lhamo, she has found a way to create beautifully improvisational quilts for my own very special cause and to create them with extremely limited resources and then transport them out of the Himalayan Mountains from the small village of Mungpoo, in the Darjeeling District of West Bengal, India to America.In this case small format art quilts destined for the Alzheimer’s Art Quilt Initiative where they have either been put up for sale or into the AAQI monthly auctions and a into the hands of admirers and quilt purchasers. One such 'quilt magnet' collector named Bill Volkening met her at the Sisters Outdoor Quilt show in 2010, and serendipitously was given one of her quilts (talk about a quilt magnet!) and a story that captivated his own heart. This led to a wonderful show of Andrea's earlier doll quilts at the Latimer Center, also here in Oregon. But others have recognized her talents as well, and her quilts have also made their way into a 2011 art quilt exhibit based on the improvisational art quilts of NW quilters in Salem's own historic Bush Barn Art Gallery, that I was fortunate to be able to see and to photograph, as well. As Andrea, she had access to all of the sewing supplies of the 60's and the quilting supplies of he early 90's. But high up in her Himalyan Mountains, Nyima had only a common pair of utility scissors, fabric given to her from another Indian quilter, and batting she had originally taken from upholstered pieces. Creating her quilts was one thing ....but finding a way to get them down the mountains and to a Post Office was quite another! I first learned of Andrea when she emailed the Alzheimer’s Art Quilt Initiative several years ago, asking AAQI founder, Ami Simms if 'she could bend the rules a bit." Nyima (Andrea) wanted to register six quilts for donation to AAQI, but couldn’t print off the confirming email because she has no printer in the Himalayan Mountains! 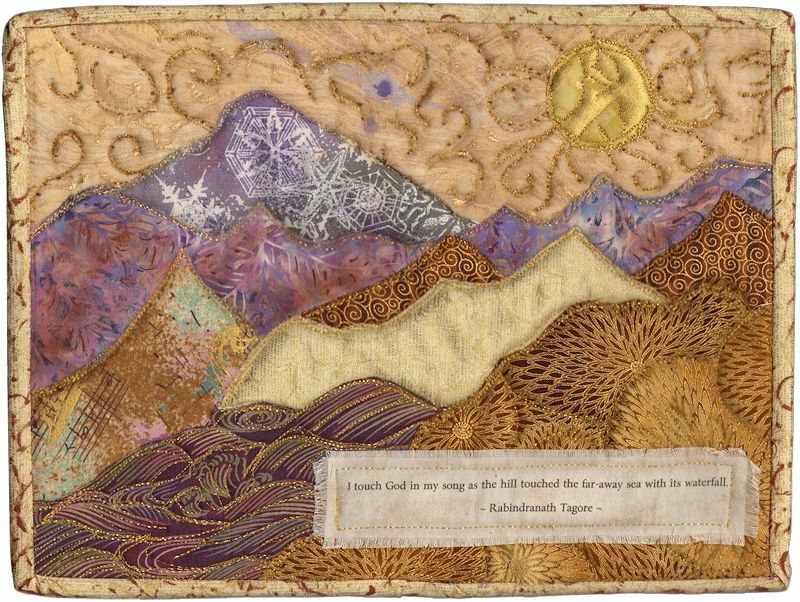 When she moved to Mungpoo in the Darjeeling District of West Bengal, India, she transformed from her previous life as a professional quilter in Oregon to .."engage in a contemplative life, I easily renounced all of my mundane activity, including quilting." Life and quilting have now combined. Her quilts are exceptionally lovely and intuitively original. But it is truly her friendship that I admire most. And because of this amazing and synchronistic set of connections, I have felt so blessed as we have traded little emails back and forth sharing details of connection between our lives that has forge a unique and greatly treasured friendship....in just little improvisational 'bits and pieces'. Her comments on a few treasured blog posts of connection between my prayers for my family members and my prayer arbor arch, which she wrote to tell me she was using as a screen saver on her own computer in the Himalayan mountains...and believe it or not.... my chickens ..who knew that there are chickens with upside down feathers roaming freely all over Mungpoo and they are called phonetically at least 'doom say' chickens? I wrote Nyima that there are three distinct types of chickens in my own world. That I think that her "dhoom-say(or)" chickens are perhaps called 'Chicken Littles'..ie. "the sky is falling, the sky is falling" ;) And that perhaps in Mungpoo, having upside down or perhaps right side up feathers, depending on your point of view, is either being a fatalist as in 'let's just get this over with', or a realist as in " it's going to rain and we are going to get wet any way!" Or I said, perhaps just being environmentally 'green' optimist' as in 'how lovely, it's raining, we should save some for later when we are thirsty or need to take a bath! Let's grow some cupping feathers for that purpose!" Can you tell it has been a great deal of fun for me and no doubt incredibly different from her usual contemplative life as a "Buddhist recluse?" Oh, my aren't I just the one to turn lots of feathers upside down with my writings? ;) I like to think that I live my own contemplative life ...a lot of it on the beaches and forests on my own little small island in Alaska , but now so much more if it on 8 lane freeways where not only do a multitude of racing cars pass before me .....along with past visions of my own life. The hills, and the songs and the music without words are all just part of all that I have read, that has influenced me, and all that has brought me to the joys of fabric and thread....and painting my own stories without a canvas. I can admire Andrea and think of all of her journeys to the special place of arrival, but it is Nyima who touches my heart with connection. So, when Bill Volkening (who currently has an exhibit of AAQI quilts on display including four of Andrea's and one of mine) emailed me and told me he had been left with a small package from Andrea that she had left with him last summer ...and that it was for me.... I was totally delighted! Imagine my delight when I opened a set of real Himalayan prayer flags all the way from Mungpoo in the Himalyan Mountains! Nyima wrote me that if I sniff carely I may even catch a whiff of mildew....reminiscent of course of the famous Himalayan monsoon season. I can only sense the love, the deepest of prayers, and the most meaningful, and dear friendship of synchronistic and heartfelt connections. 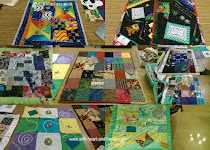 Along with my heartfelt thankyou, I sent her an email attachment of my latest little art quilt to go up for auction at Alzheimer’s Art Quilt Initiative October Auction and told her that as I designed and created it, I was thinking of her.... so many miles away and her life there in those beautiful hills. She writes me that she loves my little quilts just as she loves Tagore (the quote on the quilt) and asked me if I knew that Tagore had actually lived in Mungpoo when the Bengali plains got too hot in the summer?..I did not! But nothing I, or any of us do is ever by accident, so of course somewhere it all fit like the pieces of a puzzle of all of our lives. She says his home is now open to the public and it is so easy to fantasize that he wrote his masterpieces at his large desk on the veranda, overlooking the majestic hills. 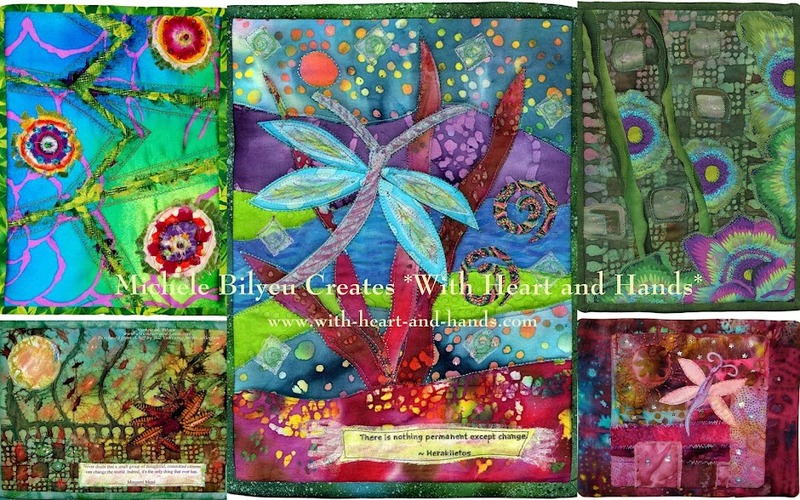 I treasure my Himalayan Prayer Flags from Nyima, just as I know others treasure their little art quilts they have bid on and purchased from AAQI made by Andrea Balosky. Each is so deeply special in each of their own ways. I know in my heart, as she knew in hers, that this was the perfect little gift of connection...prayers flags stretching now between the hills of the Cascade mountains in Oregon to the hills of the Himalayas in West Bengal. I feel so blessed and so grateful for this gift. But it is the true gift of connection that lifts up the heart and finds joy in creation and the spirit of giving and sharing.The act of creation, the joy of giving, and the manifestation of connection, fills my spirit with the present of all that is most high. And it is that song..the song of all of these hills and valleys that connect us..that is the true song of my own heart. Materials/Techniques: Batiks, hand dyes, and commercial cottons, Shiva paint sticks, ink jet printing, and metallic threads. Artist Statement: The poet, Rabindranath Tagore, said of his beloved Himalayan mountains “I touch God in my song as the hill touched the far-away sea with its waterfall." These words were my inspiration, and this this poet, my muse. Dedication: In memory of those whose lives have touched ours, as the mountains touch the sea. And to those who have inspired us to reach out with our hearts, and touch others lives in return. What a heartfelt post, Michele! Andrea has inspired me many ways. I also admire your passion and devotion to AAQI. Lovely collage at the top too. What great stories and such a pretty art quilt! It is wonderful that we can get to know other quilts across the globe. Thank you for sharing this whole story. love your blog. Another beautiful post and great photo. Such a story. I enjoy your posts so very much. This one is lovely. Wonderful post. Greatly enjoyable and really quite the story! I loved this story. It shows me that prayers are universal and include rather than exclude all. A wonderful story of sharing and giving to a cause too! A wonderfull story and a beautiful scene in your quilt. You do such nice work and I am always so happy to read all you write. I wonder how inspirational she can be with her quilt work in life. I've seen her beautiful quilt work which was quite amazing as her story of life with quilt. I wonder how inspirational she can be with her quilt work in future life. I've seen her beautiful quilt work which was quite amazing as her story of life with quilt.